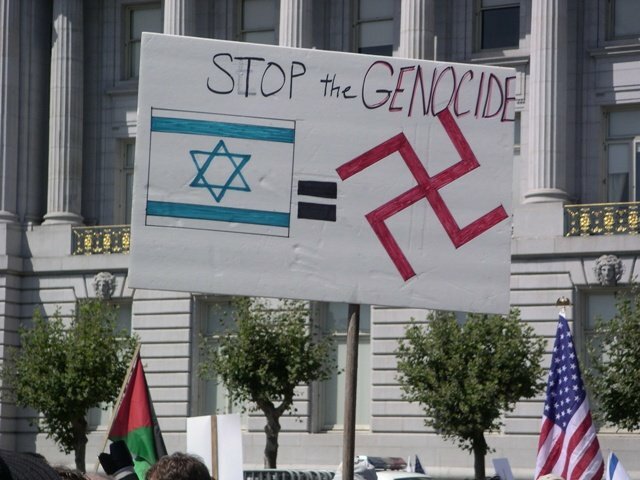 These photos were taken at the "Stop the U.S.-Israeli War" rally in San Francisco on August 12, 2006. It was one of several similar rallies held around the country on the same day. The photos pretty much speak for themselves. Captions only where needed. 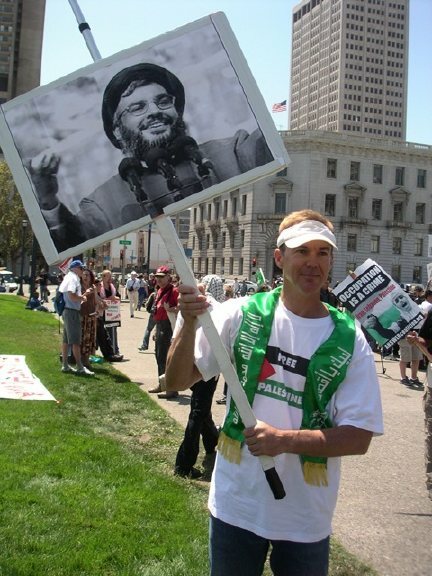 Nasrallah in front of San Franciso's City Hall. 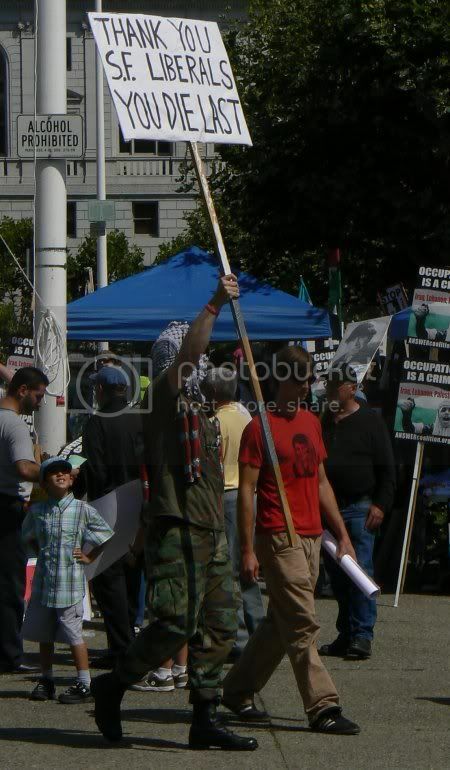 Masked protesters with a Hamas flag and a Palestinian flag. The rolling multi-billboard had placards from several different organizations. The quote on this sign -- purportedly made by Ariel Sharon -- is known to be a hoax. Hamas flag in front of San Francisco's City Hall. Wannabe anarchists wearing Guy Fawkes masks manufactured in China as promotional items for the corporate-financed pro-anarchism film V for Vendetta. "Liquid Explosives" is a reference to a plot uncovered in Great Britain two days before the rally in which Islamic militants planned to blow up airliners with explosive ingredients smuggled on board in liquid form. Gandhi and Nasrallah, together at last. Most of the A.N.S.W.E.R. guards were men in Muslim garb -- the first time I had ever seen that. One of the rally organizers. The controversial Qana photos were already being featured on signs. This was the only possible secret counter-protester I encountered. Since most other protesters were blaming Israel for every imaginable ill in the world, this guy put his obviously healthy arm in a sling and wore a shirt that said, "Israel broke my arm." Ha . . . ha? This picture and this picture by another photographer show a different secret counter-protester in the crowd that day, but unfortunately I didn't see him myself. 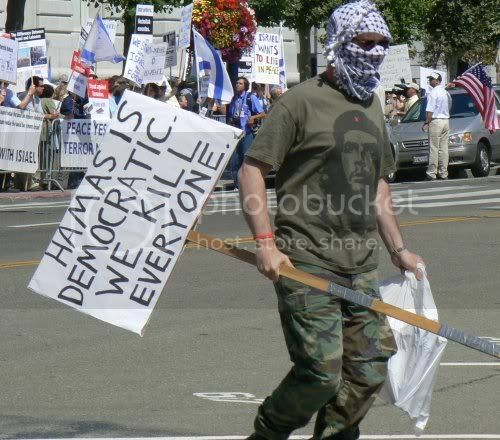 His signs said, "Hamas is Democratic. We Kill Everyone," and "Thank You S.F. Liberals: You Die Last." As the march passed through the city, this lone woman high up in a building waved a small American flag -- the only sign of dissent in sight. "Jews denounce Zionism for the evil it is and the Zionist state of Israel a heretic country whose supporters will spend eternity in Hell!!" 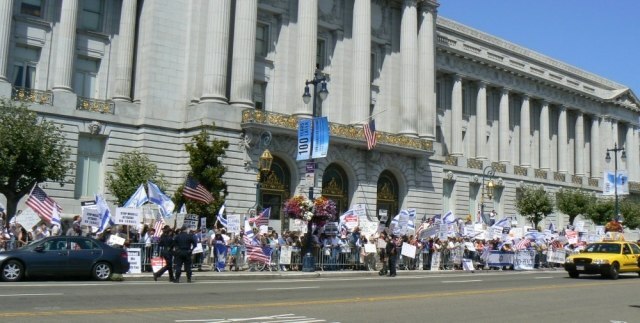 There was a well-attended pro-Israel counter-demonstration across the street from the main rally, but I did not attend or observe it. Several photos of the counter-protest can be found here in the S.F. Chronicle's coverage. Here's a picture from Dr. Mike of the counter-protest in front of City Hall: the size of the crowd was estimated by various sources at between 500 and 1,000 people at its peak. After the march, an anti-Israel man was arrested when he apparently tried to burn an Israeli flag. Several of the photos from this report were used in an August 15 news segment on Fox News, which can be viewed on YouTube here.